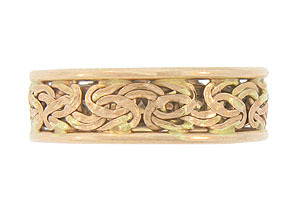 Intricately woven strands of 14K red gold encircle the face of this unique estate wedding band. Red gold bands frame the elaborate decoration. 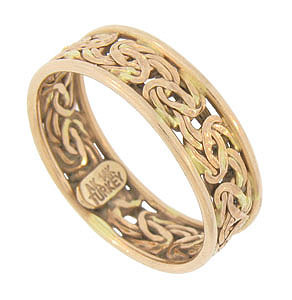 The wedding ring is marked "Turkey" and measures 6.19 mm in width. Circa: 1980. Size 7 1/2. We cannot re-size.